Talented designer Rachael Rowe has created 18 gorgeous Christmas stockings that bring a fresh, modern twist to a much loved tradition. From a huge toy sack to tiny advent calendar stockings, they feature patchwork, appliqué, embroidery and more; and all are simple to sew. 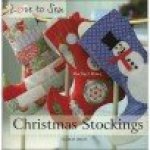 Make these beautiful stockings as gifts that your loved ones will treasure for years to come.